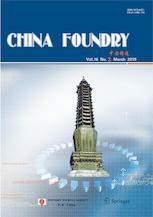 China Foundry, published bimonthly to a worldwide readership, mainly reports on advanced scientific and technical achievements, applied technology, production successes, management and leadership, recent developments and industry information in the foundry field. Coverage encompasses all casting technologies and includes, but is not limited to, novel and net shape casting technologies; casting alloy design and modification; control of nucleation, solidification and microstructure & mechanical properties; computer aided design; rapid prototyping; mold making, mold materials and binders; mold and gating design; melting and liquid-metal treatment and transport; modeling and simulation of metal flow and solidification; post-casting treatments; quality control and non-destructive testing; process automation and robotics; and safety and environmental issues. At present, distribution is to 50 countries and regions, and it is indexed and abstracted by: Science Citation Index-Expanded（since August 2007）, EBSCO, Chemical Abstracts (CA), Cambridge Science Abstracts (CSA), Abstract Journal (AJ) and Elsevier’s largest abstract and citation database – Scopus, CNKI and Wanfang Data, etc.